(a) A person propelling a bicycle upon and along a sidewalk, or across a roadway upon and along a crosswalk, shall yield the right of way to any pedestrian and shall give audible signal before overtaking and passing such pedestrian. (b) A person shall not ride a bicycle upon and along a sidewalk, or across a roadway upon and along a crosswalk, where such use of bicycles is prohibited by official traffic-control devices. (c) A person propelling a bicycle upon and along a sidewalk, or across a roadway upon and along a crosswalk, shall have all the rights and duties applicable to a pedestrian under the same circumstances. A bicycle may be ridden in a crosswalk, but pedestrians have the right of way, unless authorities have explicitly chosen to bar bikes. In Chicago, local ordinance bars adults from riding on city sidewalks, but not crosswalks. [T]hat portion of a roadway ordinarily included within the prolongation or connection of sidewalk lines at intersections, or any other portion of a roadway clearly indicated for pedestrian crossing by markings. Municipal Code of Chicago 9-4-010 (emphasis added). (b) Any portion of a roadway at an intersection or elsewhere distinctly indicated for pedestrian crossing by lines or other markings on the surface placed in accordance with the provisions in the Manual adopted by the Department of Transportation as authorized in Section 11-301. [T]hat portion of a public way between the curb, or the lateral lines of the roadway, and the adjacent property lines, intended for the use of pedestrians. Municipal Code of Chicago 9-4-010; 625 ILCS 5/1-188. A crosswalk is a part of the roadway. A sidewalk is not. If lawmakers had meant for crosswalks to be considered a part of sidewalks presumably they would have said so. They have not. Also, though crosswalks are intended primarily for pedestrians, I am not aware of any statute, ordinance or case that states that pedestrians are the only permitted users of crosswalks. (As we saw in Boub v. Township of Wayne one may be a permitted though not an intended user of a roadway.) There simply is no legal reason that supports the notion that just because it may be illegal to ride on a sidewalk that it is also illegal to ride in a crosswalk, especially in light of the language in Sec. 11-1512 which permits bikes in crosswalks so long as pedestrians are given the right of way. A person riding a bicycle . . . intending to turn left shall approach the turn as close as practicable to the right curb or edge of the roadway. After proceeding across the intersecting roadway to the far corner of the curb or intersection of the roadway edges, the bicyclist . . . shall stop, as much as practicable out of the way of traffic. After stopping the person shall yield to any traffic proceeding in either direction along the roadway such person had been using. After yielding, the bicycle . . . shall comply with any official traffic control device or police officer regulating traffic on the highway along which he intends to proceed. In other words, simply cross the road onto which you wish to travel and wait with cross traffic. When doing so the bicyclist may find, depending on the specific roadway design and traffic circumstances, that the safest and perhaps only place in which to accomplish this maneuver is in a crosswalk. In Chicago, and in parts of Illinois, this is perfectly legal. I am not advocating that bicyclists unnecessarily occupy crosswalks that are clogged with pedestrians. Doing so will often place pedestrians at unnecessary risk for injury. On the other hand, where few or no pedestrians are present and the circumstances require it, a bicyclist should not hesitate to use the crosswalk to his or her advantage. 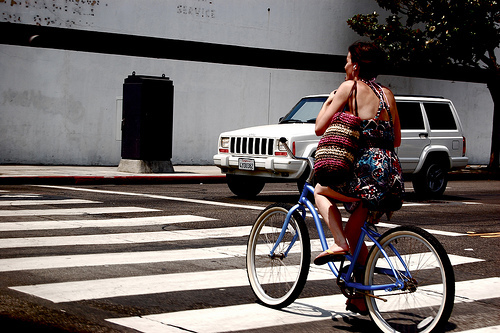 Bicyclists could ride close to the crosswalk without riding inside of it. Unfortunately, there are many bicyclists who already ride on sidewalks, so there is no need to encourage them to make use of the crosswalks,also. Unfortunately, the Chicago Park District expects bicyclists and pedestrians to share the City bikepath. Since it is first and foremost a bike path, the pedestrians are polite and careful in their usage. Wish I could say the same for the bicyclists on the sidewalk.